Join us for a movie under the stars! Bring your family, blankets, lawn chairs, snacks – and a friend too! 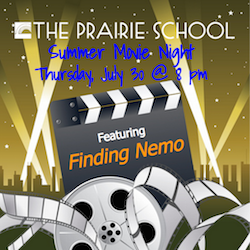 Thursday, July 30 at 8:00 p.m.
RSVPs are not required, but let us know you’re coming and you’ll be entered for a chance to win a Prairie spirit wear gift card! Contact Callie Atanasoff to confirm your attendance (262.752.2531 / cat[email protected]).